Growing up I wasn’t much of a football fan but having spent the last 5 years building features for sports fans… It’s become a passion of mine and one that I’ve dug deep on in terms of customer needs all in the name of “research” right? Despite the headlines of ebbing viewership of football… It still represents 1/3 of the top 100 programs overall (NFL 29, NCAAF 2) in the last year and remains the biggest deal in TV… period. The only thing close is the Olympics, NBA Finals, World Series and major live awards shows like the Oscar’s… and no not Game of Thrones or House of Cards—they don’t come close in terms of delivering massive audiences. Sports Guide: new this season is destination for all things football including a live scores strip, live games, replays, commentary and more. And for the first time we’ve extended that to the XFINITY Stream App so you can tune into the game while on the go (or when you can’t get control of the house TV) including broadcast channels like NBC and ABC both in and out of the home. Fantasy Football: Also new this season is a partnership with CBS Fantasy offering a personalized view of your matchups–allowing you to track the action right on your TV. Below is a view of my picks trouncing my fantasy league commissioner this week (sorry Ralph–I couldn’t resist) including ranking and analysis. 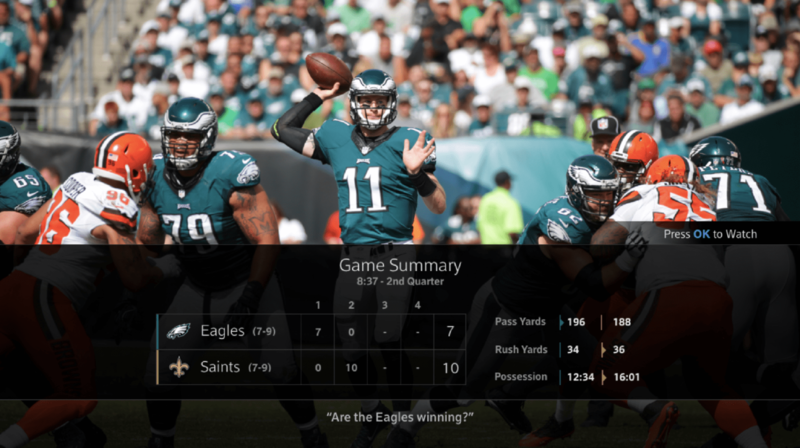 Sports Companion: The X1 Sports App allows you to keep tabs across the leagues with realtime scores, deep statistical analysis, and ability to tune in or catch-up on replays. A majority of our fans also personalize their view enabling all their favoriting teams to appear in one place regardless of what sport it is. X1 Voice Remote: greatly enhanced this season and now with full coverage of not just NFL but also NCAAF, MLB, NBA, NHL, and NCAAB. Now you can say things like “top running backs in NFL” or “Le’Veon Bell vs David Johnson stats” using your Voice Remote. Can’t watch an NFL game you’re interested in? Just ask for the team stats for any live or recently completed game (e.g. “what’s the score of the 49ers game?”) to get real-time stats. This marks the 4 year anniversary of working together with the founders of OneTwoSee and 18 months since I led the acquisition of the company. Since joining Comcast, Jason Angelides and Chris Reynolds have taken on leadership for this area under me and have led the team to even greater heights including these innovations. Their team combined with their engineering counterpart fellow Cal Poly Eng alum Matt Barbour deserve a ton of credit for not only picking winning features to build but for operating a set of features used by 1 in 4 X1 households every month… a total of half-a-billion times last year. How high will we reach this season? Can’t wait to find out but the first two weeks of football under our belt look promising even as we lap last year which followed the strong Rio Olympics. Since civilization began and the Greeks held the first Olympics 2,000 years ago sports has been watched live–and to this day it’s still by far he best way to watch whether you’re in the stadium or at home. However those rights aren’t cheap and PwC reports next year TV licensing rights will exceed venue ticket sales in terms of revenue for sports leagues. So at Comcast my team aims to make the most of those rights by making it easy and fun to follow live sports and ultimately tune into the games–making the rights worth it. So we’ll continue to expand what you can watch (e.g. streaming every Olympics event live) and make your sports experience personalized around what sports, teams and players you care about. 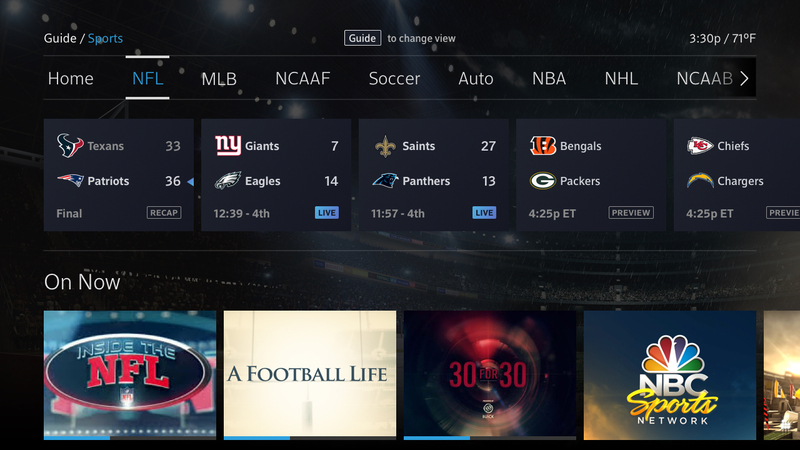 I hope you enjoy this football season and for those of you lucky enough to be Comcast X1 customers… 🙂 let me know what you think. We’re always aiming to make your experience better.